So your business has been going at this social media thing for a while and you’re feeling good. You’re confident in your posts but you’re itching to do more. What’s next? How do you push your marketing to the next level? This is an intermediate guide for social media marketing for businesses. We assume you’ve already gone ahead and gotten familiar with social media, including creating consistent posts, setting goals and engaging with your audience. If you’re looking for a more basic guide for each network, check out our topic guides here. In this guide, we’ll take you through some marketing ideas and strategies and see how other brands execute them. We hope you find an inspiring strategy to take on after reading the post. Chances are, you have multiple types of customers. Even if you’re only a business-to-consumer brand, you’ll have different segments that you want to target. Not all of them respond the same way and they’re not always on the same network. Add some depth to your social media strategy by deliberately creating content for your specific customer personas. To get started, think about your “ideal” customer. Now expand on their details: what’s their occupation, where do they live, who are their friends and what is their salary? Feeling stuck on where to even begin? Take a look at your current social media audiences and see what their demographics are like. 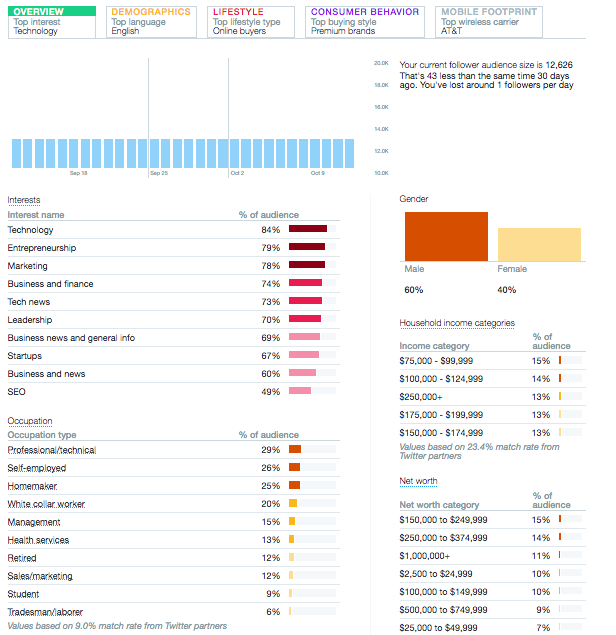 Twitter’s native analytics dashboard offers some great insights on who your audience is. Facebook also offers something similar in their own Insights. And if you need even more inspiration, conduct customer interviews. This will ultimately take more time but you’ll receive honest responses on who your customers are. If this is your first time working with personas, start with three and then expand as you feel comfortable. Write these personas down, name them and then start mapping their journey. This document will work as a reference for you as you incorporate them into your social strategy. A 16-year-old customer will likely find you in a different way than a 64-year-old customer would. How do the customers find you and ultimately purchase from you? This exercise forces you into your customers’ heads. Where in their journey do they find you on Facebook? Is it because their friend liked your Page or is it that they had a question so they contacted you in Messenger? You may find that your social messaging is a bit off or that you’re not entirely sure how they find you. That’s okay. The point of this process is to identify where you can improve. Once you have your personas set up, it’s time to create content and posts that are targeted to each. This is easy to incorporate into your usual schedule because you don’t need to alter too much. If you have three personas, pick one post a week to dedicate to one persona. Repeat for the next two weeks and analyze how the posts resonated. Lush Cosmetics has many customers and their general posts appeal to just about everyone. In this first post, they discuss one of their products and how it might relate to their customers. In this post, they target college students living in dorms, offering an alternative solution to messy bottled products. Of course, if other customers are also enticed by the bars, then that’s a side benefit. Notice that the voice doesn’t really change between posts, only the caption is more focused in its intent. Do you have the same questions get asked to you over and over again? Or do you need a way to sift through sales leads? When executed with a certain goal in mind, chatbots can elevate your marketing strategy. We have a detailed chatbot guide available to help you find the best uses for chatbots on each social channel. At the basic level, social media chatbots can help you alleviate repetitive work that your team may already be doing. Instead of a continual back-and-forth in troubleshooting, create a bot with yes/no questions that will help the customer along. By the time the customer reaches your team, you’ll know exactly what’s going on with them. 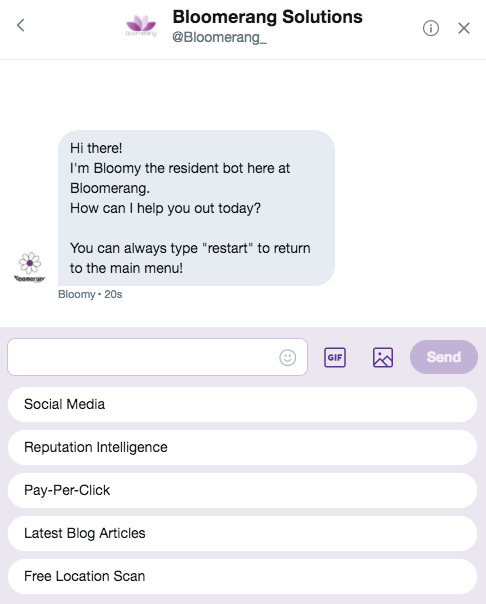 The Bloomerang Twitter account has a chatbot set up in their Direct Messages. You’re prompted with the menu when you click “Message” and it shows their most frequently asked topics. This lets you provide customers with consistent messaging about common topics without taking up your team’s time to do so. Yes, opening yourself up in any ask-me-anything type of situation can be daunting. But if you’re open to customer feedback, take advantage of an active audience and poll them like they’re your casual focus group. When you have an engaged audience that is invested in your company, these types of questions help you identify where to improve. Be as general as asking for the next product color or be specific to what video styles are resonating. Sticker Mule makes customized stickers and packaging for any business size. They often ask for feedback on their products and engage their customers in the discussions. When executing this strategy, be sure to follow through. The customers are trusting you with their ideas and ignoring them won’t help anyone. Businesses with products and services often take a multi-pronged approach to new product releases. With a new product, you might have a blog post, an introduction video on your site, an email blast and in-store signage. Social media may or may not be part of the launch plan. Instead of taking a multi-prong approach in your launch, try dedicating your efforts only to social media. Launch it in your accounts a day or so before you begin telling your other audiences. It’ll drive a more intimate, “in-the-know” atmosphere with your audience. To execute, plan a campaign with preview content, launch day content and then continual promotional content. What does all this look like? Preview content: This includes behind-the-scenes footage that might hint about the new product, posts that engage the audience by enticing them to guess what it is and anticipation posts with date and time launch information. Launch day content: What will your official launch look like? Take advantage of shoppable tags on Instagram so customers can easily purchase. If you’re a frequent poster, publish use case videos and photos. Continual promotional content: This likely isn’t the only product in your catalog. As you continue posting about your other products, intersperse with additional new product content. Share how others are using it with testimonials. By this time, you’ve likely already sent out that email blast and blog post. Big Bud Press designs and makes colorful, unisex clothing. Because they frequently sell out, they tend to give a heads up to their audience on when a specific product is available. They also like to give sneak previews of products in progress. This tactic not only helps drive interest but also gauge how much interest there will be. Maybe they’re not sure if bandanas will be a successful product. But by posting about it, they can use the excitement to estimate how much to produce. Get everyone in your company involved with new product announcements and exciting company news. Who could be a better ambassador for your products than your own company workers? To set this up, you need an internal communications plan. This can be as simple as a mass email announcement to creating a Slack channel. The communications go both ways for the social team. When wins are shared internally, help celebrate them externally. It’s good content and puts faces to names for your customers. Maybe the customer support team member recently completed a marathon. Share that with your audience to help them connect a little more to the people working behind the scenes. At the C-suite level, customers look to CEOs and co-founders for thought leadership and as an extension of the company they run. Being present on social media gives them a clearer connection to customers and an easier accessibility point. If your business is active on social media and your C-suite finds themselves navigating customer service inquiries, you should consider adding their accounts to your management tool. Anna Bond is the co-founder and COO of Rifle Paper Co. She has a very active presence on Instagram and her account is even linked in Rifle’s bio section. When they partnered with Keds Shoes, she shared the announcement on her own social media account, too. Her son was even involved in the product modeling. When customer questions came up in the post, Rifle Paper stepped in and responded. For employees that already have social media accounts, this is an easy strategy to execute. As part of your internal announcement, include some talking points about the product and photos that they can use. This should never feel like you’re forcing them to share. For those that are still learning about social media, hold a few tutorial sessions to get them acclimated to their preferred networks. 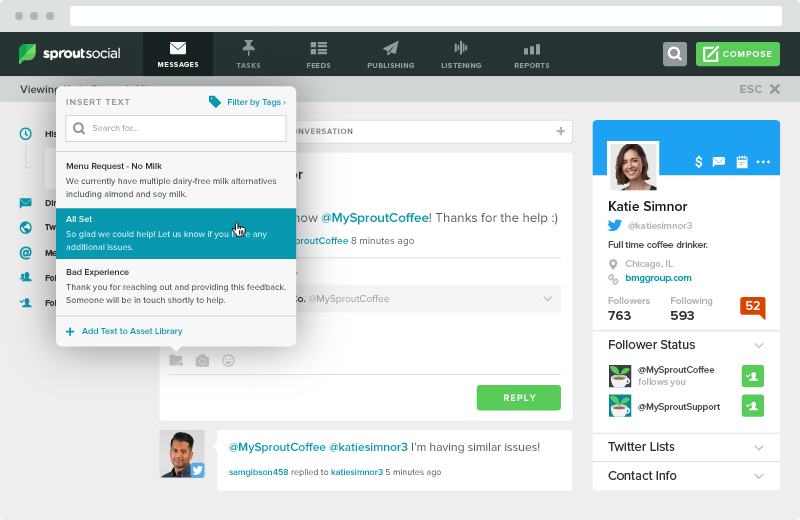 Step up your internal communications with a tool like Bambu. 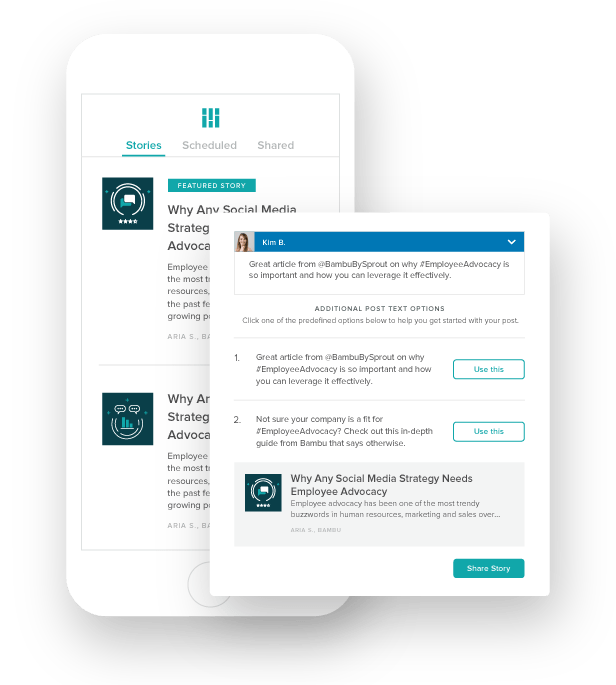 It offers solutions to employee advocacy and social amplification by letting employees utilize curated stories that they can then share with their own unique voice and style. Tweet for long enough and something will inevitably go wrong. You’ll make a misstep in your words or someone has an issue with your company. A crisis communication plan identifies crisis levels and the appropriate responses you should take. It’s easier to set this in motion before anything drastic happens. When a crisis happens, tunnel vision ensues and judgment can be impaired. Low-level crises include basic customer service issues and frequently asked questions. In fact, some might not even consider these to be crises at all, just a standard day at the social media office. To address these quickly, have some set responses on hand. In Sprout Social, you can make use of the Saved Reply feature to save time by creating and saving common replies. This feature speeds up your response time and avoids the headache of looking for that one link you need to answer a given question. Mid-level crises entail customer complaints that snowball beyond the original poster and any local news that may impact your audience. Having social listening in place for these situations is a good way to head off any viral moments. Make sure you pre-plan to some extent for these crises with some example apology copy that will strike the right tone with your audience. Then you’ll be more prepared to adjust it when a specific situation arises and respond in a way that resonates as genuine with your customers. High-level crises range from national disasters to very poor PR. In these cases, it’s best to outline who would be involved. It’s likely that a PR team would need to step in to help on wording and that the social team will be tasked with monitoring the public sentiment. Canon has a wide user base of photographers. Their large product lineup means that they have a support phone line on top of what they already navigate on social media. When an issue crops up, they try to address it immediately and in a timely fashion. If someone in their company messed up, they apologize and take the feedback into consideration. Their social media team certainly can’t solve everything but they can help out their phone team as much as possible. Once you’ve gotten into the rhythm of creating and scheduling posts, you might find yourself wanting to try something new. These strategies are meant to take your marketing to the next level. Maybe you haven’t gone viral for your product yet but you’re on your way. Try out new approaches one at a time and remember to analyze the performance afterward. Many of these can be incorporated into your current strategy. Their execution will depend on how much time and energy you’re willing and able to invest. Don’t have an internal communications tool? No sweat. Just send a company-wide email and see how it goes. If employees are sharing the news, continue with the email plan until you need a stronger solution. It’s also okay to keep one strategy at a low-commitment level while you take on on a different strategy to try out. We’d love to know what your newest marketing strategies are. What was the first thing you do after you felt comfortable with social media? Did you immediately head to the next platform? Let us know in the comments.